Confident… Feminine… and, in my opinion, the beginning of a trend. Fragrances come and go, some stick out and others fade from our recollection, this frangrance is one to prevail in its market’s longevity. 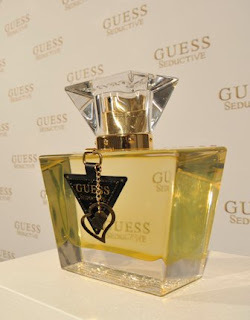 Guess has just launched their newest fragrance ‘Seductive’, and our good friends at Coty (a leader in the beauty & fragrance industry) has given us a sneak peek! The scent speaks of strength and power with a feminine touch, I love, love, love it! Guess Seductive is available in three sizes and can be purchased at most leading beauty retailers including Sephora & Shoppers Drug Mart. I have done the TO/LA flight 23 times already this year but this past trip was different because I flew with my goodies from Leaf & Rusher! They have a travel pack full of ‘Skin Tonic’ that is just made to combat the dehydration being in a plane causes. It was fantastic! During Film Fest, I had a few impromptu sleepovers and all of the products came in very handy. Esp the Green Tea facewash… You know he doesn’t have the skin care that you need! So whether you are jetsetting or pillow talking with your new boo, keep L&R in your purse.. just in case! The ingredients are super premium with natural oils and ingredients like Buriti Fruit. TX Lips – It’s an anti-aging lipscrub, that dissolves and you and keep on or rub off. I like it and I left it on! TX Formula – This moisturizer is basically heaven in a bottle. There are seaweed extracts and algae that makes you look like you skinnydipped in the fountain of youth. Yippee.. Winners all round. I have a few more products I haven’t tried yet… But so far so good – the scent and packaging is lovely and not overly gender biased. I like that.